Edition Details: 1st softcover edn. Softcover. 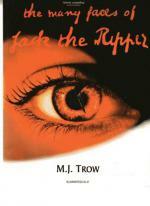 A pictorial account of the gruesome crimes of Jack the Ripper. Featuring recently discovered archive photographs of the Ripper's victims, together with atmospheric images of the crime scenes as they are today. Photographs by Tim Craddock. Profusely illus., Bibliog. and Index. 192pp. 4to. softcover. Vg+. A fairly heavy book which will require additional postage if shipped overseas.